“Satar” redirects here. For the Uyghur instrument, see Setar § Uyghur variant. For other uses, see Satar (disambiguation). Za’atar (Arabic: زَعْتَر‎, IPA: [ˈzaʕtar]), is a generic name for a family of related Middle Eastern herbs from the genera Origanum (oregano), Calamintha (basil thyme), Thymus (typically Thymus vulgaris, i.e., thyme), and Satureja (savory). 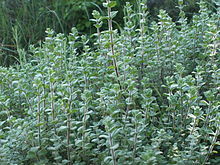 The name za’atar alone most properly applies to Origanum syriacum, considered in biblical scholarship to be the hyssop (Hebrew: אזוב‎ [eˈzov]) of the Hebrew Bible. It is also the name for a condiment made from dried hyssop leaves, mixed with sesame seeds, dried sumac, and often salt, as well as other spices. Used in Levantine cuisine, both the herb and spice mixture are popular throughout the Middle East. Written history lacks an early definitive reference to za’atar as a spice mixture, though unidentified terms in the Yale Babylonian Collection may be references to spice blends. According to Ignace J. Gelb, an Akkadian language word that can be read sarsar may refer to a spice plant. This word could be attested in the Syriac satre, and Arabic za’atar (or sa’tar), possibly the source of Latin Satureia. Satureia (Satureja) is a common name for Satureja thymbra, a species of savory whose other common and ethnic names include, “Persian za’atar”, “za’atar rumi” (Roman hyssop), and “za’atar franji” (European hyssop). In the Modern Hebrew language, za’atar is used as an Arabic loanword. Thymus capitatus (also called Satureja capitata) is a species of wild thyme found throughout the hills of the Levant and Mediterranean Middle East. Thyme is said to be a plant “powerfully associated with Palestine“, and the spice mixture za’atar is common fare there. Thymbra spicata, a plant native to Greece and to Israel and has been cultivated in North America by Syrian, Palestinian, and Lebanese immigrants for use in their za’atar preparations since the 1940s. 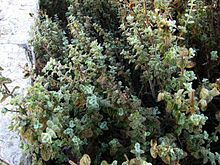 Another species identified as “wild za’atar” (Arabic:za’atar barri) is Origanum vulgare, commonly known as European oregano, oregano, pot marjoram, wild marjoram, winter marjoram, or wintersweet. This species is also extremely common in Lebanon, Syria, Jordan, Israel, and the Palestine, and is used by peoples of the region to make one local variety of the spice mixture. Other Latin names for the herbs called za’atar in Arabic include Origanum syriacum (also known as Bible hyssop, Arabic oregano and wild marjoram) and Origanum majorana (sweet marjoram). Both oregano and marjoram are closely related Mediterranean plants of the Lamiaceae family, so it is unsurprising that they could be used interchangeably. Za’atar as a prepared condiment is generally made with ground dried thyme, oregano, marjoram, or some combination thereof, mixed with toasted sesame seeds, and salt, though other spices such as sumac might also be added. Some commercial varieties also include roasted flour. Traditionally, housewives throughout the Fertile Crescent, Iraq, and the Arabian Peninsula made their own variations of za’atar, which was unknown in North Africa. In Morocco, za’atar mix consumption is sometimes seen as a trait of families with Andalusian roots, such as many inhabitants of Fez. Recipes for such spice mixtures were often kept secret, and not even shared with daughters and other relatives. This general practice is cited by Western observers of Middle Eastern and North African culinary cultures as one reason for their difficulties in determining the names of the different spices used. Some varieties may add savory, cumin, coriander or fennel seed. One distinctively Palestinian variation of za’atar includes caraway seeds, while a Lebanese variety sometimes contains sumac berries, and has a distinct dark red color. Like baharat (a typically Egyptian spice mix of ground cinnamon, cloves, and allspice or rosebuds) and other spice mixtures popular in the Arab world, za’atar is high in anti-oxidants. Za’atar, both the herb and the condiment, is popular in Algeria, Armenia, Egypt, Iraq, Israel, Jordan, Lebanon, Libya, Morocco, Palestine, Saudi Arabia, Syria, Tunisia, and Turkey. There is evidence that a za’atar plant was known and used in Ancient Egypt, though its ancient name has yet to be determined with certainty. Remains of Thymbra spicata, one species used in modern za’atar preparations, were found in the tomb of Tutankhamun, and according to Dioscorides, this particular species was known to the Ancient Egyptians as saem. Along with other spiced salts, za’atar has been used as a staple in Arab cuisine from medieval times to the present. Za’atar has historical significance for Palestinians, some of whom see the presence of za’atar as the signifier of a Palestinian household. For Palestinian refugees, plants and foods such as za’atar also serve as signifiers of the house, village, and region from which they hailed. Once used mainly by Arab bakeries, za’atar is now a common herb in Israeli cuisine. Some Israeli companies market za’atar commercially as “hyssop” or “holy hyssop”. Hyssopus officinalis is not found in the wild in Israel, but Origanum vulgare is extremely common. Ecologists found that wild za’atar was on the verge of extinction in Israel due to over-harvesting. In 1977, an Israeli law was passed declaring it a protected species. Violators are subject to fines. Some Arab citizens of Israel (who traditionally picked the wild herbs) have described the legislation as “almost anti-Arab”. The ban on picking wild za’atar is also enforced in the West Bank. In 2006, za’atar plants were confiscated at IDF checkpoints. Za’atar is traditionally dried in the sun and mixed with salt, sesame seeds and sumac. It is commonly eaten with pita, which is dipped in olive oil and then za’atar. When the dried herb is moistened with olive oil, the spread is known as za’atar-wu-zayt or zeit ou za’atar (zeit or zayt, meaning “oil” in Arabic and “olive” in Hebrew). 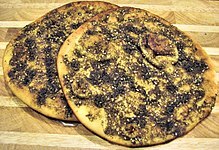 This mixture spread on a dough base and baked as a bread, produces manakeesh bi zaatar. In the Middle East, ka’ak (a soft sesame seed bread, known as ka’akh in Hebrew), is sold in bakeries and by street vendors with za’atar to dip into or with a za’atar filling. Za’atar is used as a seasoning for meats and vegetables or sprinkled onto hummus. It is also eaten with labneh (yogurt drained to make a tangy, creamy cheese), and bread and olive oil for breakfast, most commonly in Jordan, Palestine, Israel, Syria, and Lebanon, as well as other places in the Arab world. The Lebanese speciality shanklish, dry-cured balls of labneh, can be rolled in za’atar to form its outer coating. 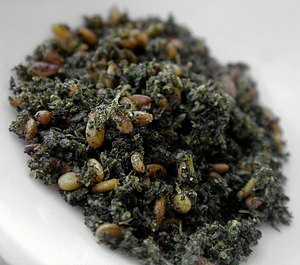 The fresh za’atar herb is used in a number of dishes. Borek is a common bread pastry that can be stuffed with various ingredients, including za’atar. A salad made of fresh za’atar leaves (Arabic: salatet al-zaatar al-akhdar) is also popular throughout the Levant. The recipe is simple, consisting of fresh thyme, finely chopped onions, garlic, lemon juice, olive oil and salt. A traditional beverage in Oman is za’atar steeped in boiling water to make an herbal tea. Since ancient times, people in the Middle East have thought za’atar could be used to reduce and eliminate internal parasites. In the Levant, there is a belief that za’atar makes the mind alert and the body strong. For this reason, children are encouraged to eat a za’atar sandwich for breakfast before an exam or before school. This, however, is also believed to be a myth fabricated during the Lebanese Civil War to encourage eating of za’atar, as provisions were low at the time and za’atar was in abundance. Maimonides (Rambam), a medieval rabbi and physician who lived in Spain, Morocco, and Egypt, prescribed za’atar for its health advancing properties. ^ Based on the Judeo-Arabic translation of the word in the works of Rabbi Saadia Gaon (in his Tafsir, a translation of the Pentateuch, Exo. 12:22), David ben Abraham al-Fasi (in his Hebrew-Arabic Dictionary of the Bible, known as `Kitāb Jāmiʿ al-Alfāẓ`, vol. 1, s.v. אזוב), Rabbi Jonah ibn Janah (Sefer HaShorashim – Book of the Roots, s.v. אזב – aleph, zayn, bet), Maimonides (in his Mishnah Commentary, Nega’im 14:6) and Nathan ben Abraham I in Mishnah Uktzin 2:2. The problems with identification arise from Jewish oral tradition where it expressly prohibits Greek hyssop, and where the biblical plant is said to have been identical to the Arabic word, zaatar (Origanum syriacum), and which word is not to be associated with other ezobs that often bear an additional epithet, such as zaatar farsi = Persian-hyssop (Thymbra capitata) and zaatar rumi = Roman-hyssop (Satureja thymbra). See: The Mishnah (ed. Herbert Danby), Oxford University Press: Oxford 1977, s.v. Negai’im 14:6 (p. 696); Parah 11:7 (p. 711). ^ Aliza Green. 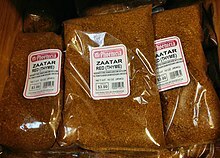 “Za’atar”. CHOW. Retrieved 2008-03-09. ^ a b Rozanne Gold (July 20, 1994). “A Region’s Tastes Commingle in Israel”. The New York Times. Retrieved September 4, 2014. ^ Florence Fabricant (October 28, 1992). “Food Notes”. The New York Times. Retrieved September 4, 2014. ^ a b c d The Poetry Society, 2006, p. 5. ^ “Multilingual Multiscript Plant Name Database: Sorting Origanum names”. Michel H. Porcher, University of Melbourne. Retrieved 2009-08-28. ^ a b c Philologos (May 19, 2006). “Za’atar: On Language”. The Jewish Daily Forward. Retrieved September 4, 2014. ^ a b “Recipes of the West Bank Olive Harvest”. NPR. November 21, 2007. Retrieved 2008-03-14. ^ Jennifer Bain (August 15, 2007). “The zing of za’atar”. Toronto Star. Retrieved September 4, 2014. ^ a b c Savill and O’Meara, 2005, p. 273. ^ Israel and the Palestinian Territories. Lonely Planet. 2007. p. 63. ISBN 978-1864502770. ^ This is usually rendered as English marum (defined by the Oxford English Dictionary as Thymus mastichina or Teucrium marum), but Dalby interprets this as Origanum syriacum and translates it as zatar; Dalby, 2000, p. 189. ^ Dorothea Bedigian (September 2004). “History and Lore of Sesame in Southwest Asia”. Economic Botany. 58 (3): 330–353. doi:10.1663/0013-0001(2004)058[0330:HALOSI]2.0.CO;2. ISSN 0013-0001. ^ a b c “Hyssop: Adding Spice to Life in the Middle East”. Israel Ministry of Foreign Affairs. 1998-07-01. Archived from the original on August 30, 2004. ^ a b Daniel Rogov (November 30, 2001). “A mixup over a biblical herb”. Haaretz. Retrieved 2008-03-14. ^ Vered, Ronit (March 13, 2008). “Forbidden Fruit”. Haaretz. Retrieved September 4, 2014. ^ “The Palestinians: It is the little things that make an occupation” (PDF). The Economist. January 18, 2007. p. 64. ^ Jacki Lyden (March 5, 2005). “Lebanese Writers Offer Alternate Views of Beirut”. Weekend Edition Saturday. NPR. Retrieved September 4, 2014. ^ Joan Nathan (November 12, 2008). “A Short History of the Bagel”. Slate. Retrieved September 4, 2014. ^ Joan Nathan (November 9, 1996). “Diversity in the dining room helps ring in Israel’s new year”. Houston Chronicle. Archived from the original on December 31, 2008. Retrieved 2008-03-09. ^ Marshall Cavendish, 2007, p. 309. ^ Khan Marwa, Sarfaraz; Khan, Muhammad Aslam; ur-Rehman, Fazal-; Bhat, Inayat Ullah (2009). “Aromatic Plant Species Mentioned in the Holy Qura’n and Ahadith and Their Ethnomedicinal Importance”. Pakistan Journal of Nutrition. 8 (9): 1472–1479. doi:10.3923/pjn.2009.1472.1479. Allen, Gary (2007). The Herbalist in the Kitchen (Illustrated ed.). University of Illinois Press. ISBN 978-0-252-03162-5. Basan, Ghillie (2007). Middle Eastern Kitchen. with special photography by Jonathan Basan. Hippocrene Books. ISBN 978-0-7818-1190-3. Carter, Terry; Dunston, Lara; Humphreys, Andrew (2004). Syria & Lebanon. Lonely Planet. ISBN 978-1-86450-333-3. Cheshin, Amir S.; Hutman, Bill; Melamed, Avi (2001). Separate and Unequal: The Inside Story of Israeli Rule in East Jerusalem (Illustrated ed.). Harvard University Press. ISBN 978-0-674-00553-2. Dalby, Andrew (2000). Empire of pleasures: luxury and indulgence in the Roman world (Illustrated ed.). Routledge. ISBN 978-0-415-18624-7. Dalby, Andrew (2002). Dangerous Tastes: The Story of Spices (Illustrated ed.). University of California Press. ISBN 978-0-520-23674-5. Gardner, Jo Ann (2004). Herbs in bloom: a guide to growing herbs as ornamental plants. illustrations by Holly S. Dougherty (Reprint, illustrated ed.). Timber Press. ISBN 978-0-88192-698-9. Heine, Peter (2004). Food culture in the Near East, Middle East, and North Africa (Illustrated ed.). Greenwood Publishing Group. ISBN 978-0-313-32956-2. Isser, Stanley Jerome (1976). The Dositheans: a Samaritan sect in late antiquity. Brill Archive. ISBN 978-90-04-04481-4. Kaufman, Cathy K. (2006). Cooking in ancient civilizations (Illustrated, annotated ed.). Greenwood Publishing Group. ISBN 978-0-313-33204-3. Lien, Marianne E.; Nerlich, Brigitte, eds. (2004). The Politics of Food. Berg Publishers. ISBN 978-1-85973-853-5. Manniche, Lise (1989). An ancient Egyptian herbal (Illustrated ed.). University of Texas Press. ISBN 978-0-292-70415-2. Marín, Manuela; Deguilhem, Randi (2002). Writing the feminine: women in Arab sources — Volume 1 of The Islamic Mediterranean. I.B. Tauris. ISBN 978-1-86064-697-3. Marshall Cavendish Corporation (2007). Peoples of Western Asia (Illustrated ed.). Marshall Cavendish. ISBN 978-0-7614-7677-1. Nabhan, Gary Paul (2004). Why some like it hot: food, genes, and cultural diversity. Island Press. ISBN 978-1-55963-466-3. Ray, Krishnendu (2004). The Migrant’s Table: Meals and Memories in Bengali-American Households. Temple University Press. ISBN 978-1-59213-096-2. The Poetry Society, ed. (2006). Poetry on a Plate: A Feast of Poems and Recipes (2nd ed.). Salt Publishing. ISBN 978-1-84471-114-7. Roberts, Margaret (2000). Margaret Roberts’ A-Z Herbs: Identifying Herbs, How to Grow Herbs, the Uses. Struik. ISBN 978-1-86872-499-4. Savill, Joanna; O’Meara, Maeve (2005). The SBS eating guide to Sydney: a guide to Sydney’s world of restaurants, cafes & food shops (10th, illustrated ed.). Allen & Unwin. ISBN 978-1-74114-578-6. Seidemann, Johannes (2005). World Spice Plants. Berlin: Springer. ISBN 978-3-540-22279-8. Swedenburg, Ted (2003). Memories of revolt: the 1936–1939 rebellion and the Palestinian national past. University of Arkansas Press. ISBN 978-1-55728-763-2. Alexander Fleisher; Zhenia Fleisher (April–June 1988). “Identification of biblical hyssop and origin of the traditional use of oregano-group herbs in the Mediterranean region”. Economic Botany. 42 (2): 232–241. doi:10.1007/bf02858924.